Once every 3-4 weeks I connect with other craft bloggers to blog about our own take on the same topic. Not only is it fun for me, but it's helpful for you - if you're looking for a bunch of crafts revolving around the topic (usually a holiday), you're in the right place! This time, we're doing recycled crafts for Earth Day (or Earth Month). 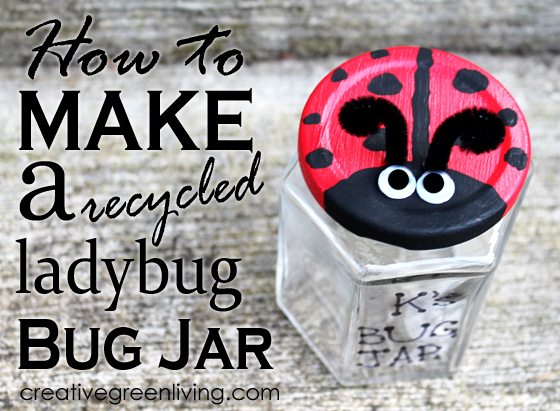 So not only will I teach you how to give an old jar new life as an adorable bug home, but some of my favorite crafting friends have lots of great projects connected at the bottom of this post - be sure to check them out! (if you are reading this via e-mail or a blog reader, you will need to click through to my post to see the other projects). Be sure to check out all of my recycled craft projects here and my Great Green Crafts pinterest board as well! Paint the lid of the jar red. 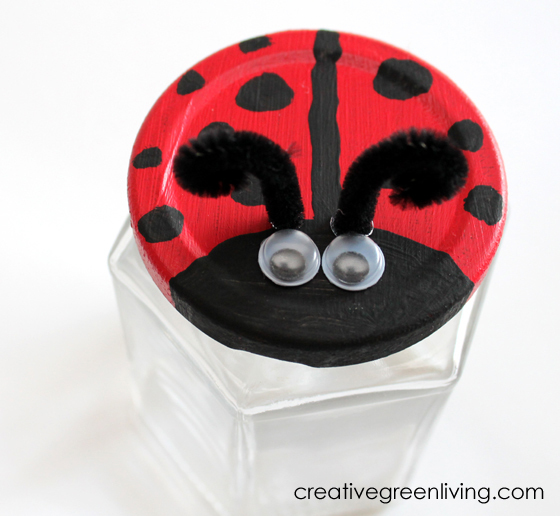 Once dry, use black paint or a permanent marker to add ladybug details like a head, line and dots. Allow to dry completely before moving on to step 2. Use hot glue to attach gooogley eyes. Cut two pieces of chenille stem 2 inches in length. Curl the tops as shown and use hot glue to attach to lid. 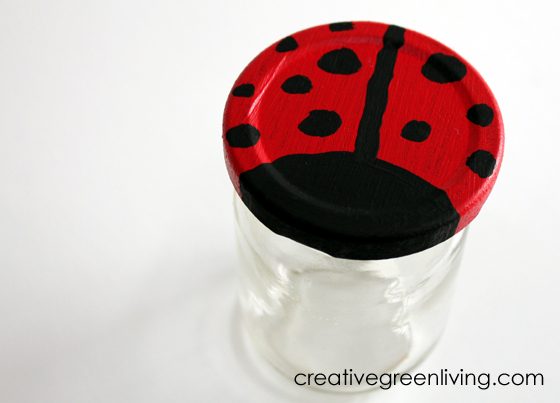 Use a permanent marker or black paint to personalize your jar. 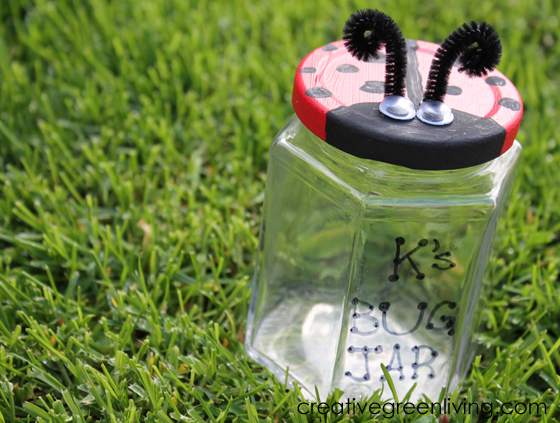 I wrote "K's Bug Jar" in a fun connect-the-dots style font. 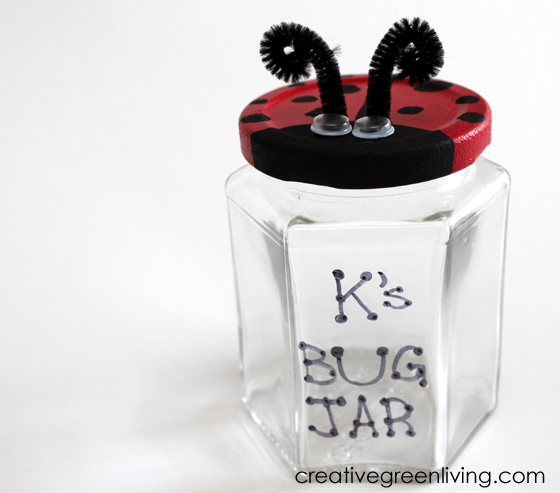 Now that your bug home is complete, have fun collecting bugs to put inside! What a great idea, Carissa! Not only is it adorable, but it is a fun way to spend a Spring afternoon with the kiddos...thanks for the inspiration! 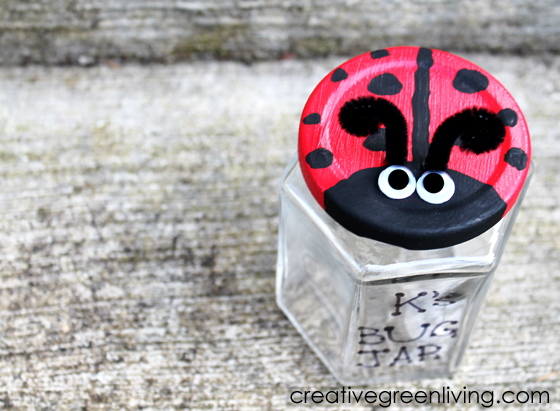 One of my girls LOOOOOVES ladybugs...she'd adore this! That actually looks like something I could do since I'm so craft challenged! 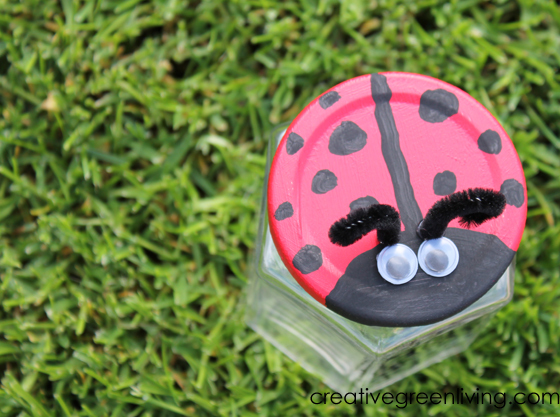 My daughter loves to craft and she'd have a great time painting the lid with me. She an collect the bugs with her dad though! My daughter is having a ladybug themed birthday party on Sunday. She'd love this...only she's afraid of real ladybugs. Andrea @ be-quoted.com visiting from SITS. Very cute idea! But shouldn't you poke a few holes in the lid if you are going to put bugs into it?